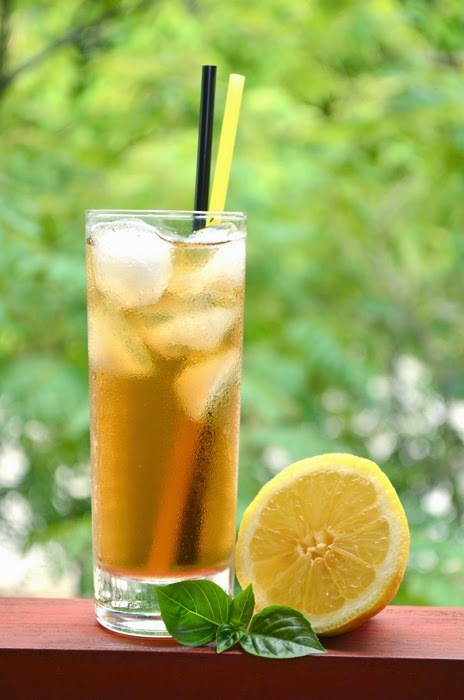 American Iced Tea - 2 methods, 3 steps and 5 tips! What's the one-stop, 100% summer drink for you? I'm pretty sure lots of people will go for iced tea. I know it one of my favourites! 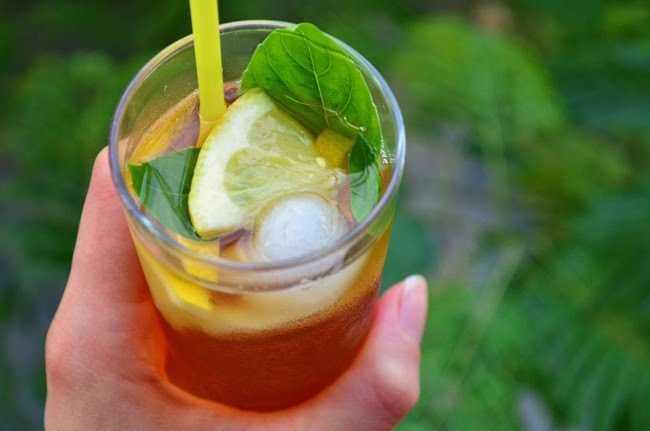 There's nothing that says summer like a glass filled with ice cubes, drizzled with tea and topped with lemon with a sprig of mint to the side. But that might just be my opinion.. But let's focus on iced tea. One of the things that really surprised me about the iced tea is this: the recipes for iced tea haven't changed at all! I mean, a recipe from 1877 is the same as a recipe you fill find on the internet right now. 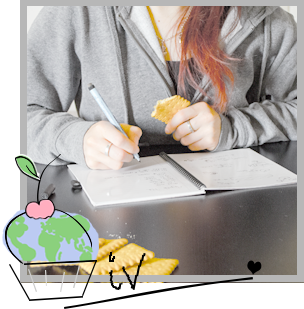 For most recipes you will find a shift in the ingredients: less sugar, less salt or less fat (most of them were needed for preservation reasons). But iced tea remains the same - with only 3 ingredients perhaps I shouldn't be too surprised. 1. Keep it fresh. Use the best, healthiest and highest quality ingredients you can find: clear water, leaf tea and good quality ice (preferably your own). Serve the tea the same day and keep no longer than 2-3 days. 2. Keep it simple. Avoid flavoured teas such as "apricot&ginger", but go for plain black or green tea or a combination of those two for the best results. 3. Make a slightly stronger (and sweeter) tea than you are used to: flavours are less intense once they cool down. 4. Use sugar for hot tea and syrup for cold tea. Because sugar dissolves in hot water, but not in cold! 5. Add a slice of lemon or orange and a sprig of mint: it looks good, it tastes good and it's as traditional as you can get. And here's one tip from me! Bonus tip: Keep peoples preferences in mind. If you know beforehand how sweet you like your tea then add sugar to the boiling water. If you're not sure, or you're serving multiple people with different preferences make a simple sugar syrup and serve that alongside the iced tea. 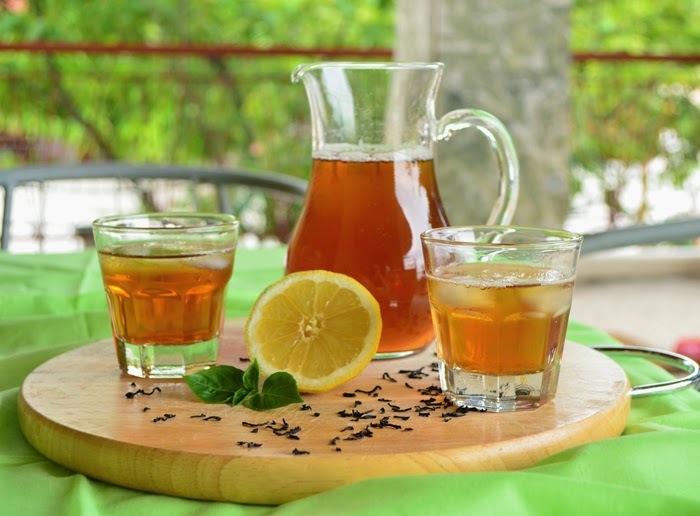 Because brewing the Perfect Iced Tea is not about making your perfect iced tea but making one that everyone can enjoy in their own way. 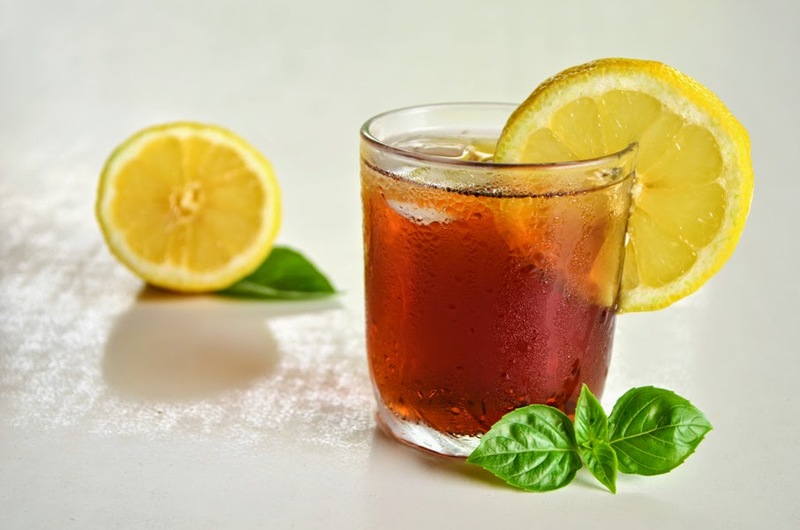 So now that we have roughly an idea what to look out for in the ingredients and way we make it: here's two recipes for making iced tea. One according to the hot-brew method and one according to the cold-brew method. 1. Boil up a cup of tea. Make it slightly stronger and sweeter than you are used to. 2. Leave to cool on your counter. 3. Serve with ice cubes or crushed ice and a slice of lemon & a sprig of mint (and an umbrella, a straw and inside a super-fancy tall glass for the ultimate summer feeling). 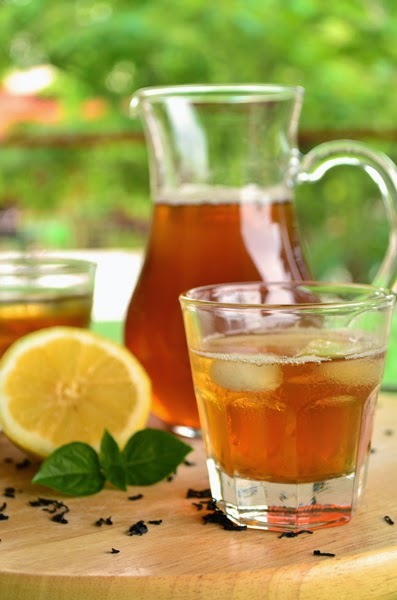 If you're in a hurry of making iced tea, you're stuck with using the hot-brew method. But there's a way of making iced tea even faster. I stole this tip from the way they prepare iced coffee here in Greece: [Extra Quick iced tea:] boil up an extra strong and sweet cup of tea. Dump in a few ice cubes and stir until the ice cubes have melted. If the tea is still warm, repeat with more ice cubes. Then fill up the glass with ice cubes and serve. This way you'll be diluting the tea a lot more so you'll really need that extra strong and extra sweet cup of tea to balance it out. But if you're really and immediately craving a cup of iced tea - this is the way to go! 2. Add syrup to taste. 3. Serve with ice cubes or crushed ice and slice of lemon & a sprig of mint (and another umbrella, another straw and another one of those super-fancy tall glasses for the ultimate summer feeling). * 1 part sugar, 1 part water: boil until sugar is dissolved. ** Some recipes recommend the fridge, some recommend putting it in the sun: whatever floats your boat. I believe putting it in the sun will take less long to develop the flavour, but this is theory. What I found out about the cold brew method is that the steeping time varies greatly for black teas and green teas. Black teas don't need as long as green teas by far. Apart from that I found it's important to use the right tea for the right method. I tried both methods with both black and green teas and found the green teas to be much better for the cold brew method and black teas for the hot brew method. The reason being iced tea with the cold brew method gets strong very fast. A black tea ended me up with a very bitter iced tea. A green tea however, gave me a very round and flavourful tea. The hot brew method suits the black tea much better, whereas it misses out on the full flavour of the green tea. But honestly, it's all a matter of preferences. Do you really like your cup of tea and would you like to be able to drink it even when it's hot outside? Or do you prefer infused water and would you like a different take on that? The recipes in this post have been reduced to 1 glass only, just to make it easier. Please go ahead and make more than 1 glass! Just keep in mind that the amount of teabags does not scale with the amount of glasses you want. 1 glass of tea will use 2 teabags, but so will 3!